The London Underground was the world’s first underground railway, opened in 1863 at the height of the Victorian era. Today the system has expanded to one of the busiest public rapid transit systems in the world with 11 lines, 270 stations and over 400 Km (250 miles) of track serving a large part of Greater London and parts of the surrounding counties of Buckinghamshire, Hertfordshire and Essex. Scene showing the construction of the Metropolitan Railway close to Kings Cross station, London. Illustration shows the trench ploughed though the main road and partially completed cut and cover tunnel. Image was published in The Illustrated London News, February 1861. In 1859, work began on the privately built Metropolitan Railway to carry both passengers and goods across the capital more efficiently. 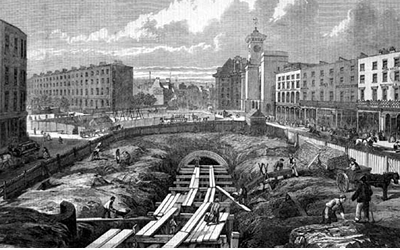 More than 2,000 workers built the line, mostly by hand, digging a shallow cutting for the track before roofing it over to form a tunnel. Taking four years to construct, London’s Metropolitan Railway became the world’s first underground passenger line. The service opened to the public on 10 January 1863 with gas-lit wooden carriages hauled by steam locomotives. Electrification of the system wasn’t introduced until the early 1900s. The 3.5 mile (5.6km) line ran from Paddington to Farringdon, linking the mainline stations at Paddington, Euston and King’s Cross with the business district of central London. 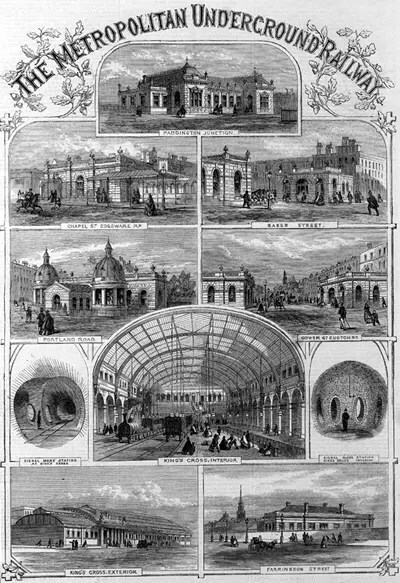 Montage of the Metropolitan Railway’s stations, published in the Illustrated London News in December 1862, the month before the railway opened. The line was an instant success when it opened four years later and, in its first year, carried almost ten million passengers. London’s ‘Tube’, as it would come to be known, was born. The line was soon extended from both ends, and northwards via a branch from Baker Street. It reached Hammersmith in 1864, Richmond in 1877 and completed the Inner Circle in 1884. The most important expansion of new routes was the line north into the Middlesex countryside, where it stimulated the development of new suburbs. Harrow was reached in 1880, and the line eventually extended to Verney Junction in Buckinghamshire, more than 50 miles (80 kilometres) from Baker Street and the centre of London. Click here to view the Wikipedia entry for the London Underground.